-- and he had to check it as luggage. I had to hold it in both my hands to carry it in from the car. It fed the boyfriend and me for two days. I'm not kidding. 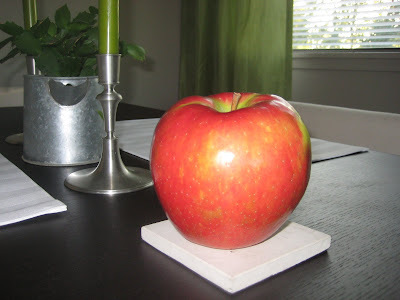 This beauty is called a Honey Crisp and the name couldn't better reflect the apple. Sweet and crunchy (Honey Crisp is a much better name though, don't you think?) -- the juice, like nectar. It was the most delicious apple I've ever had. 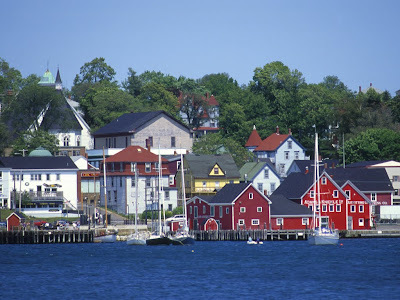 Now, if you're like me, when you think of Nova Scotia you think lobsters and fishing boats, not apples. So of course Derek also brought us four live lobsters (he was able to carry these on the plane). I've seen lobsters in tanks at those strange Chinese restaurants where many sad looking fish and crustaceans stare back at you begging to be released back to the wilds. I've had the most amazing lobster grilled cheese sandwich at Joey's and I've had the misfortune of wearing a Red Lobster bib on the rare occasion I've found myself at the restaurant. But I have never had a live lobster in my home. I've heard the horror stories of them screaming when they hit the boiling water. I've read Julie & Julia and MTAOFC and know the trials of preparing a live lobster. I wasn't prepared to put any living thing into a pot of boiling water. Enter the boyfriend. His theory (as told by Derek) was that if you hold them upside down long enough they "fall asleep" and then you quickly plunge their heads into boiling water and they never wake up. Ever. His other theory (shared by many) is that lobsters don't feel pain. I'm not so sure. I think anything would experience some negative impact when thrown into a pot of boiling water. I've heard frozen peas squeal. The boyfriend held the lobster and I got the scissors out to snip the rubber bands off its claws. I wanted to leave them on but the boyfriend didn't think they would add anything to the meal, so off they came. And the "sleeping" lobster immediately started snapping. It's little globular eyes sought out mine, it clacked it claws, it wiggled its many spidery legs and it freaked me out. "Quick, into the pot" I hollered at the boyfriend. The lid was firmly in place, we looked at each other and breathed a sigh of relief. No screaming. All we had to do now was wait twenty minutes or so until they were a bright red and the antennae pulled out easily (my god, you've got to be kidding me!). We fired up the barbeque to cook some steaks just in case the lobster didn't turn out. Twenty minutes later, with the steaks eagerly awaiting their fate, we removed the lid and looked inside. It was a thing of beauty. Two bright red, really dead lobsters. We pulled them out of the pot and now that my food wasn't moving I had no qualms about stabbing a knife through its head and pulling its claws off. I think we both felt as if we had ventured from our cave, tracked our prey, killed it and dragged it back to cook it over our fire. Grunt. It was delicious. And we had leftovers for lobster mac and cheese. Talk about comfort food. Thanks Derek. Where are you going next? I do enjoy your posts! Wonderful description and love your 'killing machines' label. I'd heard that freezing a lobster for a while before boiling it was the way to go although I've never tried. Funny that, I'm exactly the same, have no problem with food that doesn't move. Does look heavenly though once on the plate; I can taste it from here. MMMmm. One has to appreciate the work of getting food on the table. Especially, food like this. So glad I stumbled on your lovely lovely blog today, it's always nice to find other blogger out and about on the net. I do enjoy your cool posts too!